Today’s supply chains extend across the world and trade is a truly global phenomenon. It is therefore an issue of national security for every country to ensure the sustainability of their exports and imports. In a 2016 study IIASA researchers examined the resilience of the seafood trade in the face of global change. Seafood plays an important role in food security, making up nearly 20% of animal protein consumption around the world. At the same time, seafood supplies are vulnerable to natural disasters, fishery collapses, policy changes, and price spikes in fossil fuels. 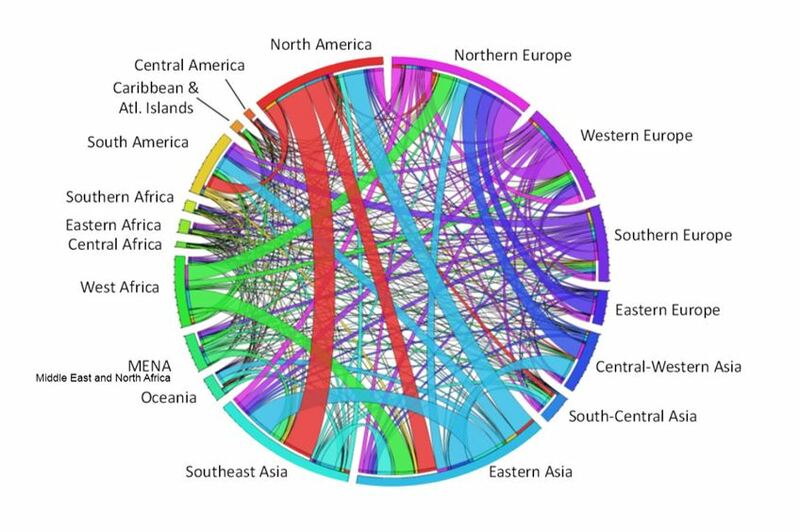 To examine how seafood trade might be affected by such shocks, researchers from the IIASA Advanced Systems Analysis and Evolution and Ecology programs developed a shock-propagation global trade network model. The results show that Central and West Africa are the most vulnerable to shocks. In addition, if such an event did occur, richer regions might be more willing to prioritize their domestic consumption, which would pass on the shock to other regions in the trade network. If this is taken into account in the model, the researchers found, Central and West Africa are even more at risk. These findings suggest that countries can reduce their overall vulnerability to shocks by reducing reliance on imports and diversifying food sources. As international seafood trade grows, identifying these types of potential risks and vulnerabilities is important to build a more resilient food system . Global seafood trade among world regions. A band’s width represents the traded biomass and a band’s color represents the importing region. The new study assesses the vulnerability of world regions to supply shocks in this trade network. Gephart JA, Rovenskaya E, Dieckmann U, Pace ML, & Brännström Å (2016). Vulnerability to shocks in the global seafood trade network. Environmental Research Letters 11: 035008.